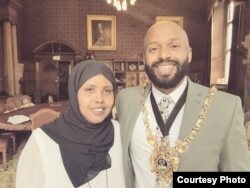 He is a former refugee, a Muslim, and now the first Somali-British mayor, the youngest ever Lord Mayor for Sheffield city in the United Kingdom. The 28-year-old Magid Magid has also become the first Green Party mayor. He was sworn in Friday. "This really was a victory for the Somalis and other Muslim communities in Sheffield," Kaltum Osman, a young Somali woman who also won a seat at Sheffield's City Council, told VOA Somali. "This was a victory for the young men and women of Sheffield. It was a clear message for every person that's been told they have limits on their dreams." Magid was born in Burao, a town in the northern breakaway region of Somaliland. Osman said Magid came to Sheffield when he was five years old, after spending six months in a refugee camp in Ethiopia with his mother and five siblings. "He came here at a young age, grew up and as young man he was very ambitious and thought that there was nothing that could prevent him from being what he wanted to be," Osman said. Speaking during his inaugural ceremony, Magid said he remembered little about his early childhood in Somalia and that he had never returned to his country of birth. "I remember just being happy, playing around as you do as a kid, but in reality it was a completely different story," he said. But Magid said he remembered well the difficulties his family experienced as refugees, especially when they arrived in Sheffield's Burngreave area, where his family set up home. "Life was difficult when my family arrived. We were struggling with learning the language and adapting to a new way of life. My mother worked as a cleaner to take care of me and siblings," he said. Magid studied aquatic zoology at the University of Hull, developed an interest in politics while at university, and in 2016 was elected as Green councilor for Broomhill and Sharrow Vale ward in Sheffield.